ABOVE, GRENADA DAY FACEBOOK; INSET, MILITANT/TAMAR ROSENFELD Hundreds attend Grenada Day in Brooklyn, N.Y., Aug. 26. Inset, Socialist Workers Party supporter Gale Shangold, right, shows fairgoers Maurice Bishop Speaks, with speeches by central leader of 1979-83 revolution in Grenada. 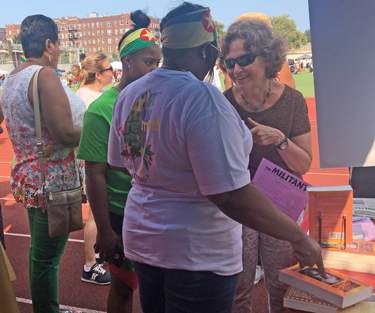 NEW YORK — Many of the hundreds of participants at the annual Grenada Day festival in Brooklyn here were hungry for books by revolutionary leaders Maurice Bishop, Thomas Sankara, Malcolm X and others. Socialist Workers Party members and supporters fanned out from a booth they set up as part of the daylong event Aug. 26, holding up Maurice Bishop Speaks, a book of speeches by the central leader of the 1979 revolution in Grenada, and “The Second Assassination of Maurice Bishop” by Steve Clark, in New International no. 6, which explains how the revolution was overthrown in a 1983 counterrevolutionary coup. A combined total of 57 of those books were grabbed up by festival participants. Celebrating its 10th year, the festival featured a wide array of cultural presentations, including performances by musicians who traveled from the Caribbean island for the event. A similar festival took place in Toronto. Thousands of Grenadians who participated in the revolutionary struggle there led by Bishop and the New Jewel Movement now live in New York and the region. Their revolution overthrew U.S.-backed dictator Eric Gairy and established a workers and farmers government. Notable were the young people who stopped in their tracks when they saw Maurice Bishop Speaks. One woman said, “My mother loves him!” Getting the book was her first chance to read Bishop’s words for herself. After coming to power in March 1979, Grenada’s workers and farmers took control of governing their own country. Mass organizations were formed to organize the involvement of women and youth. In his article Clark describes Bishop’s efforts to defend the revolution and resist a coup secretly organized by a counterrevolutionary faction led by Bernard Coard. On Oct. 19, 1983, a massive uprising of some 30,000 Grenadians — close to one-third of the island’s population — poured into the streets and freed Bishop from house arrest. Troops loyal to Coard turned their guns on the demonstrators, killing and wounding many. Bishop and five other leaders of Grenada’s revolutionary government and the New Jewel Movement were murdered in cold blood. Coard and his faction’s conspirators imposed a four-day, round-the-clock, shoot-to-kill curfew on the Grenadian people. One week later, the U.S. rulers took advantage of the destruction of the revolution and invaded, capturing a disarmed and demoralized people. Many who stopped by the booth described what they had experienced during those final days of the revolution. Some participants said they already owned a copy of Bishop Speaks, but stopped by to get the New International with “The Second Assassination of Maurice Bishop” article. Four people picked up copies of Thomas Sankara Speaks, which reprints speeches of the leader of the 1983-87 revolution in Burkina Faso. Five people subscribed to the Militant, and four got copies of Malcolm X, Black Liberation, and the Road to Workers Power by SWP National Secretary Jack Barnes, in combination with one of the books on Grenada’s revolution or a subscription. Thirty-three people signed up to receive information on a Militant Labor Forum being organized to discuss the legacy of Bishop and the Grenada Revolution. This is the second time the SWP has had a table with revolutionary literature at Grenada Day. The first was in 2014. One fairgoer said that he has come to the event every year since, looking for these books. We told him we would be back next year. For anyone interested in finding books on lessons from revolutions and other working-class battles, visit the SWP office nearest you.